We Buy Houses® has local offices throughout the country for your convenience! Just enter the zip code of the house you'd like to sell, and we'll connect you with our home buyer. 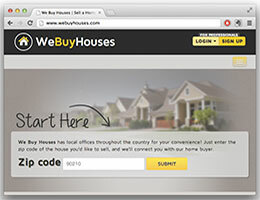 We Buy Houses®, the original cash home buyer expands in markets throughout the United States. As the only official We Buy Houses® company, we work to connect homeowners who want to sell their house quickly to a local We Buy Houses® home buyer. We needed quite a bit of repairs on the house. We knew we couldn't put in on the real estate market to sell it, so I'm very pleased with what we received and how the process went. I got in a situation where I needed to sell my house. I called WeBuyHouses.com® and these guys hooked me up, took good care of me. They did it quickly and easily with no problems.